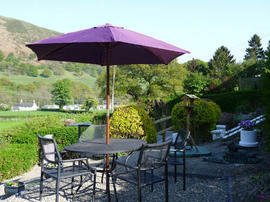 Velvet Cottage is a 3 bedroom holiday cottage situated in a stunning setting one and a half miles North of Llangollen. Positioned above a quiet lane and backed by National Trust owned Velvet Hill, the fully furnished self catering accommodation is an ideal base for North Wales holidays. Velvet Cottage is all-electric and features thermostatically controlled radiators and timer-controlled water heating. The kitchen is equipped with a fridge-freezer, microwave oven, electric cooker and 4 ring hob, kettle and toaster. Bed linen, towels, heating and unlimited WiFi (subject to Terms and Conditions Acceptance) are provided. The master bedroom features a superking double bed and a period dressing table. 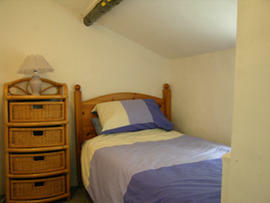 A second bedroom contains twin single beds and a cosy single bedroom completes the sleeping facilities. An electric shower, sink, bath and toilet can be found in the well equipped, warm upstairs bathroom. 2 farm shops, 1 bistro & 2 pubs in walking distance, infrequent bus service, rubbish collection (Thursdays). The cottage is one and a half miles North of Llangollen. From Llangollen Town Centre: Take the A452 signposted Horseshoe Pass. Continue for one and a half miles until Valle Crucis Abbey appears on the right. Look for a left turn with a red telephone box on the corner. This road is Abbey Terrace, Velvet Cottage is one hundred yards on the left. 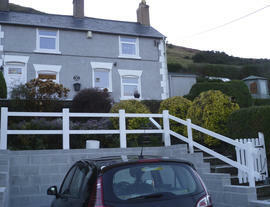 Low season: (Winter) £285/week and £175/weekend. 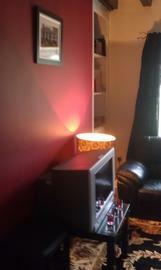 Mid season: (Spring and Autumn) £395/week and £200/weekend. 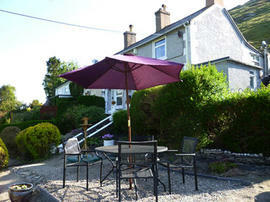 High season: (Summer) £485/week and £225/weekend. The cottage is open all year. Changeover day is Saturday but other days can be arranged. Weekends can be booked subject to availability.